How will what just happened affect my investments? You don’t need to be a property developer (allegedly) worth billions or a former Secretary of State who earns six figures per speech to have a financial stake in the outcome of this year’s three presidential debates — not to mention the election itself, which is fast approaching. If you have a retirement account or brokerage account, you’re a legitimate investor and you have a lot to lose or gain during the next four years. Presidential debates don’t happen often but, when they do, they can really move markets, at least in the short term. According to one view from Fisher Investments on the presidential debate, candidates are rarely able to deliver on their debate promises, so the long-term impacts are likely more muted. That said, Merrill Lynch argues that unexpected debate outcomes can cause uncomfortable price swings in the short term. 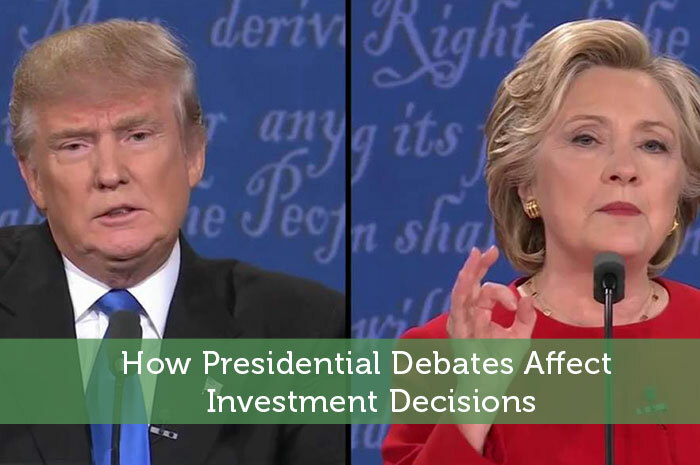 With this in mind, here’s a look at how presidential debates can affect investment decisions by large and small investors alike. Anecdotal evidence has long suggested that professional investors dislike uncertainty in any form. There’s now mounting evidence that political uncertainty is especially unwelcome. According to Enterprising Investor, some 64% of delegates at the Eurasia Group’s 2016 convention expected geopolitical uncertainty to increase during the next 12 months — a level of sentiment that closely correlates with volatile stock market movements. Some of that uncertainty is tied to global events such as Brexit and China’s ongoing economic slowdown. But a not-insignificant share has roots closer to home — in the improbable and, for many, unsettling candidacy of Donald Trump. All this brings us to an important corollary consideration. Stocks themselves might be neutral and politically unbiased, but the human professionals whose decisions move markets aren’t so evenhanded. Despite vocal examples to the contrary, such as Carl Icahn, many Wall Street movers and shakers are quietly but firmly rooting for Hillary Clinton to prevail in the coming contest. The overarching reason for so-called Clinton favoritism is simple: Despite her populist campaign trail rhetoric, she’s a known quantity next to Donald Trump, who remains a virtual Rorschach test on economic policy. Post-debate market movements are therefore likely to track closely with Secretary Clinton’s performance. Strong performances are likely to correlate with positive market movements, while weak performances are likely to correlate with negative movements. Following middling performances that fail to change the character of the race, market movements are likely to be subdued or inconclusive. One of the most tiresome political truisms asserts that “presidential campaigns don’t matter” — in other words, that macro factors such as the state of the economy matter more than the actions or pronouncements of either major-party candidate. This is a dangerous fallacy in any year, and doubly so in this most unusual political season. The fact is, candidates’ policies and statements do impact presidential contests, particularly when they’re close. Though campaign promises rarely become law in any recognizable form, investors take notice when they deviate from expectations or sharply contrast with recent statements. For instance, a candidate who becomes noticeably more protectionist between the first and second debate is likely to spook investors — even if he or she continues to blow the political equivalent of hot air.